Maynard was killed after being struck by a London Underground train in the early hours of this morning. Tom Maynard: struck by London Underground train. SURREY’S TOM MAYNARD, one of England’s most promising batsmen, has died at the age of 23, the county said today. Maynard was killed after being struck by a London Underground train in the early hours of Monday morning. In a statement, Surrey said Maynard, the son of former Glamorgan and England batsman Matthew Maynard, was “an incredibly talented young batsman”. British Transport Police (BTP) confirmed a 23-year-old man, named locally as Maynard, had been hit by a train early this morning. A BTP spokesman said: “BTP officers were called to the line near Wimbledon Park London Underground station on Monday, 18 June after a man was struck by a District line train. “The incident was reported to BTP at 5.03am (0403GMT) and was also attended by Metropolitan Police officers. London Ambulance Service medics attended but the man, believed to be 23 years old, was pronounced dead at the scene. 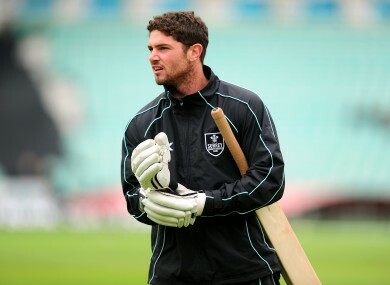 Tom Maynard began his career with Glamorgan before joining Surrey at the start of last season. He left after his father was forced out from a coaching position with the Welsh county in 2010, saying his position had become “untenable”. Surrey’s statement said Maynard was “an incredibly talented young batsman”, who had “impressed in all forms of the game”. Surrey chairman Richard Thompson said: “Our thoughts at this awful time are with Tom’s family and friends and all those that were close to him. Tom Maynard was a prodigiously talented young batsman who had made an incredible start to his career and was clearly destined for far greater things. Surrey’s Twenty20 game against Hampshire at The Oval on Wednesday has been postponed as a mark of respect. Email “Shock as rising English cricket star Maynard dead at 23”. Feedback on “Shock as rising English cricket star Maynard dead at 23”.